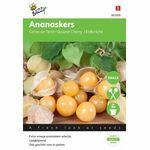 Ground Cherry Seeds - 600 Different kind of garden seeds on stock! Ground Cherry actually have different names: Cape pineapple growers, Cape berry, Cape gooseberry or Goudberry. The Latin name is physalis peruviana. The cultivation is comparable to that of tomato, the plant also shares the same diseases and pests. Ground cherry are, contrary to what many people expect, a semi-hard plant. In the Netherlands it is easier to grow the plant as a yearly because hibernation is quite a hassle. Therefore we recommend sowing each year again, with the additional reason that biennial plants are less productive.